A near-complete fossilised skeleton uncovered in India is thought to the country's first evidence of the presence of the Jurassic ichthyosaur. The creatures, whose name translates as 'fish lizards' from ancient Greek, were large marine reptiles which lived alongside dinosaurs in the Mesozoic Era. Their remains have been discovered as far afield as the Americas, Europe and Australia, but never in this part of the globe. 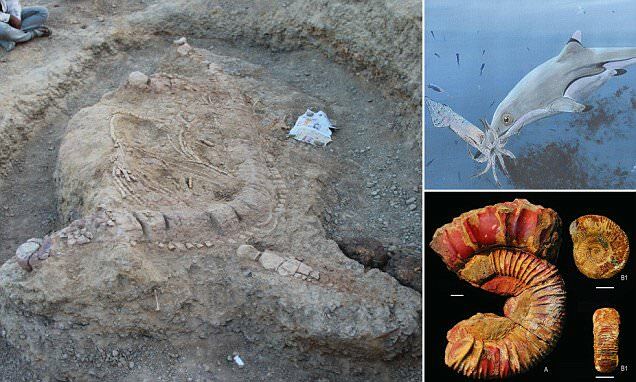 Researchers from the University of Delhi made the find in the Kachchh area in Gujarat. The near-complete skeleton, nearly 5.5 metres (20 ft) long, is thought to belong to the Ophthalmosauridae family. It likely lived between around 165 and 90 million years ago. It was found among fossils of ammonites and squid-like belemnites, and its tooth wear patterns suggest it lived on these types of hard, abrasive sea creatures. While the authors have not yet been able to pinpoint the ichthyosaur's species, they believe that a full identification could lead to a discovery of possible ophthalmosaurid dispersal between India and South America. They hope that unearthing more Jurassic-era spines in this region could provide further insights into the evolution of marine reptiles on this part of the planet. Lead author Guntupalli Prasad said: 'This is a remarkable discovery. 'Not only because it is the first Jurassic ichthyosaur record from India, but also it throws light on the evolution and diversity of ichthyosaurs in the Indo-Madagascan region of the former Gondwanaland (Jurassic supercontinent).